Redbarred dragonet larvae (Synchiropus rubrovinctus) were raised from wild-spawned eggs at 77-79F on wild and cultured copepod. First record of Redbarred dragonet culture. 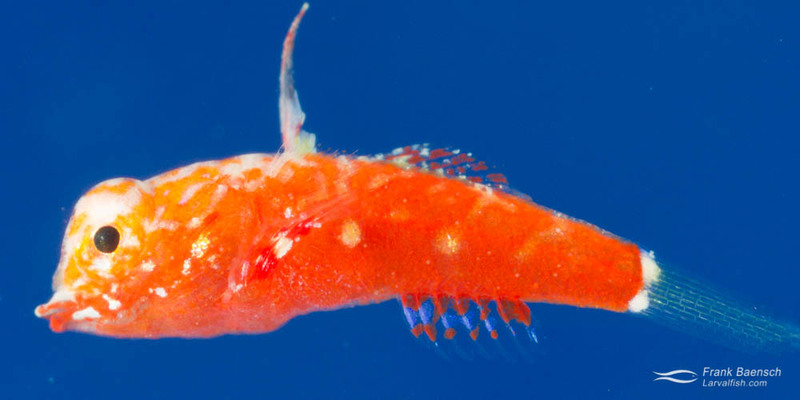 The Redbarred Dragonet or Tiny Hawaiian Dragonet, Synchiropus rubrovinctus, is a rare, cryptic dragonet species that has only been found around Japan, New Caledonia and Hawaii at depths of 3 to 260 feet (1 to 80 m). It reaches a maximum size of just 5 cm (1.9”) (personal observation). Laboraotry reared juvenile Tiny Hawaiian dragonet (Synchiropus rubrovinctus) released on the reef. S. rubrovinctus juveniles were raised in the spring of 2011-2015 from eggs collected in coastal waters off Oahu. The larvae measure just 1.1 mm TL at hatching. They are able to feed on small copepod nauplii (Parvocalanus sp.) at first feeding (3 dph), despite their small size (1.9 mm TL). Preflexion larvae develop deep red pigmentation on the body with dense melanophores on the tail and mid trunk section. Flexion occurs near 10 dph at 3.1 mm TL. Metamorphosing larvae are bright red in color. They complete settlement by 20 dph (6 mm TL). Tiny Hawaiian dragonet (Synchiropus rubrovinctus) larvae reared in the laboratory. S. rubrovinctus larvae are very easy to raise on copepods (Parvocalanus sp.). Juveniles can be effectively grown out on newly hatched artemia and shredded frozen seafoods. Spawning behavior was observed after 6 months between a large male (50 mm TL) and multiple slightly smaller females. This attractive species is easy to grow out to market size in a relatively short time and would make an excellent nano reef fish. All cultured S. rubrovinctus were donated to growers or released into the ocean.